Thailand has cremated its most senior Buddhist monk in an elaborate ceremony in Bangkok, more than two years after he died. Supreme Patriarch Somdet Phra Nyanasamvara died in October 2013 aged 100. His cremation was delayed in line with Thai Buddhist custom. The patriarch's remains were carried through the streets of Bangkok on a carriage, accompanied by a long procession of monks. Thousands of people attended the ceremony, including Thailand's Crown Prince Maha Vajiralongkorn, who lit the funeral pyre. "It is the royal tradition to keep the body for a long time," Somchai Surachatri, a spokesman for the National Office of Buddhism, told AFP. "It takes a long time to prepare the flowers, details, prayers," he added. Somdet Phra Nyanasamvara was made supreme patriarch in 1989 by Thailand's King Bhumibol Adulyadej. 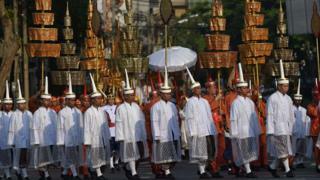 The country's last large-scale royal funeral was that of Princess Galyani, who died of cancer in January 2008. She was cremated in November that year. About 95% of Thailand's population is said to follow Buddhism. Why is Buddhism so hip?